Content Objective: I will be able to engage in a collaborative discussion on graffiti by working in a group to create my section of the argument by completing the debate index card. Language Objective: I will be able to follow the given outline to organize my argument. ​Homework: Practice presenting with your index card in the mirror at least five times, or until you can present without reading off the card. 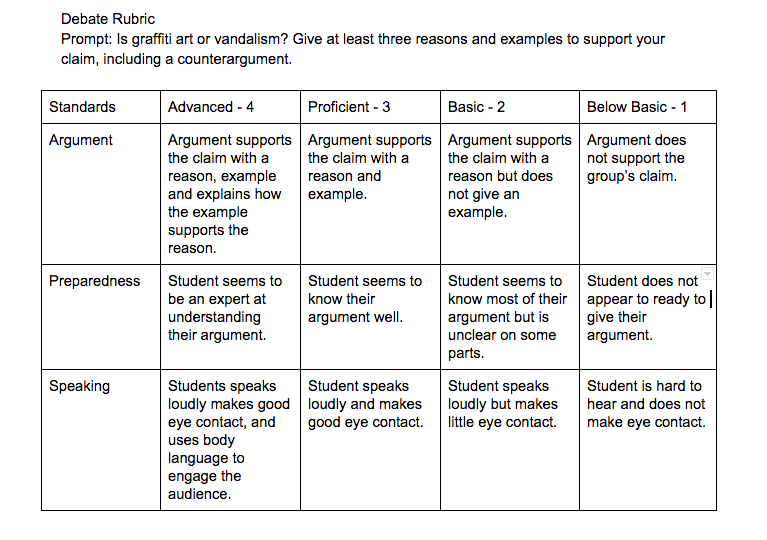 Do Now: Create an outline of an argumentative paragraph. What features do you need? 1. To have a debate, you must be prepared. Working with your group, plan out your section of the debate. Plan your section of the debate by completing the outline on your index card. Click here to see the outline for each section. Practice presenting your section of the debate. Exit Ticket: Show Mr. Westrup your completed Index Cards.